How is Social Media Putting our Youth at Risk? There are many benefits of our society’s youth using social media. These include: enhanced learning opportunities, accessing health information, socialization and communication and the overall enhancement of their individual creativity. Although these benefits are helpful there is growing and overwhelming evidence that young people having access to social media also represents significant risks. These risks include; cyber-bullying and online harassment, sexting, distraction from learning, addiction to social media, Facebook depression and exposure to inappropriate/violent content . Cyber bullying is a major issue in our society. Nearly 43% of kids have been bullied online and 1 in 4 has had it happen more than once. The problem that we face is that 80% of kids agree that bullying online is much easier than bullying someone in person. Kids hide behind their phones because they are afraid of the outcome their comments could if they said them in person. Unfortunately only 68% of teens think that cyber bullying is an issue worth fixing. So many teens are on Facebook everyday and have seen a form of bullying online but don’t say anything to anyone with authority about it because it has just become the norm in our society. Sexting is another large problem. Sexting is sending, receiving, or forwarding sexual photos or sexually suggestive messages through text message or any form of social media. Sexting is also linked to cyber bullying because if an inappropriate picture of a teenager gets into the wrong hands then it could then be used as a form of blackmail. This is a very serious problem and approximately 20-30% of teens have sent or received a sext. Whether it was or was not wanted. Girls were asked to send a sext 68% more often than boys, and are asked to send a picture of themselves and they are most of the time harassed to the point where they give in and send a sexual picture. This sort of pressure should not be forced on our youth. Distraction is a major factor nowadays and more often than not students are caught using social media in class. This happens to majority and i know this because i know that sometime i catch myself checking my own social media accounts on the occasion. This is seen as a minor problem to students but they don’t know how much information they are missing when they do visit their social media. They are distracted from important information which then leads to students struggling with their classwork and assignments. Ultimately leading to a lot of built up unnecessary stress. On average your every day person checks their phone up to 85 times a day. This number increases if the person is of ages 15-18. This brings us to our next topic which is addiction. Addiction to social media is not a myth. Over 70% of teens have smart phones and are constantly checking what is going on on their social media sites. This negatively affects their everyday life. children and teens are constantly being told to get off their social devices and to experience the world around them. Most people are addicted to social media to some extent but it seems most popular in youth. A major issue that comes with addiction to social media, is that even though children and teens are connected through their phones they often find it difficult to connect with people without their devices. It is a growing phenomenon that teens are finding it increasingly difficult to live their life in the moment. Facebook depression is a real issue and is often overlooked. There’s no question that Facebook is very popular with its 1.23 billion users in countries all around the world. With status updates, group messages, personal messaging, and online games, Facebook seems to be a perfect device for staying in contact with friends and family members without ever needing to leave the house. So why do so many Facebook users report feeling depressed and lonely? 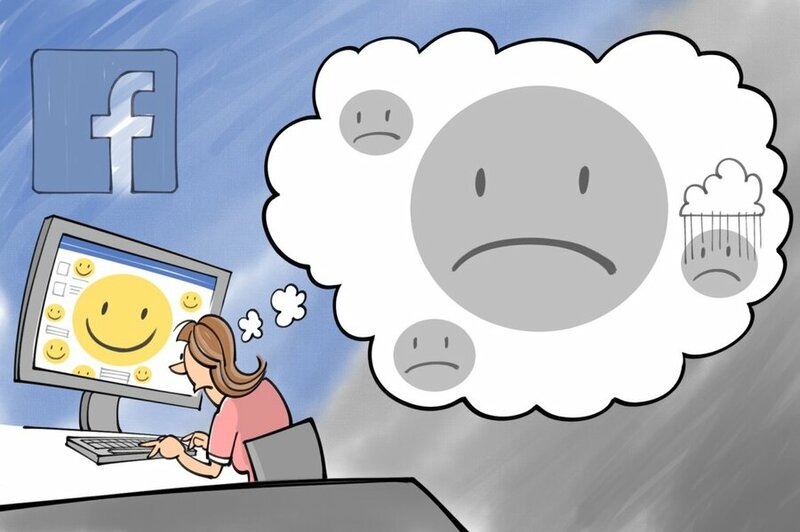 Teens Access Facebook everyday with the expectation that it will boost their current mood but instead they are left feeling sad or unfulfilled. This is caused by teens comparing their lives. If they see posts about all the fun things people are doing and then compare it to what they are doing they start to feel sad and that their life is of less worth. Inappropriate content is available to any teen or child on social media. They could be scrolling through Facebook or just surfing the internet. Children should not be exposed to violence or sexual content at a young age as it can effect their lifestyle and their overall view of the world. If it weren’t for social media and the internet children would be able to live their life innocently and how they are meant to. Because the internet allows access to anything, at anytime, to anyone, the impact can be significant and often damaging to developing minds. Based on the statistics shown above social media creates problems in both the mental and physical side of society especially our youth. Removing the use of social media is impossible so instead many people have come up with an effective way to limit the negative affects of social media on teens and children such as; putting filters on certain websites to change what is able to come through their timeline, turning off notifications so they don’t get distracted, setting a timer to help control the use, etc. Also keeping track of the use and way children and teenagers interact with people online. It is very important that parents understand these risks and take them into consideration when they allow their young and developing children to have such social media accounts. Anon, (2017). [online] Available at: https://www.psychologytoday.com/blog/media-spotlight/201505/exploring-facebook-depression [Accessed 10 Nov. 2017]. Anon, (2017). [online] Available at: https://www.psychologytoday.com/blog/teen-angst/201207/the-dangers-teen-sexting [Accessed 10 Nov. 2017]. Business 2 Community. (2017). Negative Effects of Social Networking Sites for Students. [online] Available at: https://www.business2community.com/social-media/negative-effects-of-social-networking-sites-for-students-0311887 [Accessed 10 Nov. 2017]. HuffPost. (2017). Teens Addicted to Social Media. [online] Available at: https://www.huffingtonpost.com/judith-johnson/teens-addicted-to-social-_b_9696378.html [Accessed 10 Nov. 2017]. Performancing. (2017). Negative Effects of Social Networking Sites for Students – Performancing. [online] Available at: http://performancing.com/negative-effects-of-social-networking-sites-for-students/ [Accessed 10 Nov. 2017]. Santhosh, H. (2017). 6 Positive And 4 Negative Effects Of Social Media On Children. [online] MomJunction. Available at: http://www.momjunction.com/articles/negative-effects-of-social-media-on-children_00353633/#gref [Accessed 10 Nov. 2017]. This entry was posted in Uncategorized by annaryan1. Bookmark the permalink.